Toon was special from the day he was born. He was chosen from hundreds of pups to be named Mattoon in honor of a Guide Dog trainer who passed away from cancer. I was privileged to raise “Toon” to become a Seeing Eye Guide Dog. As a puppy, he never had to be shown how to do something more than once. He mastered every command almost instantly. Because of his intelligence and caring disposition, he was placed into the Breeding Farm of The Seeing Eye to get more puppies like him. He sired almost 80 puppies at The Seeing Eye and was retired from the Breeding Farm at age three and a half years. I was fortunate enough to adopt him back and bring him home. I have been blessed to have him for 10 years. 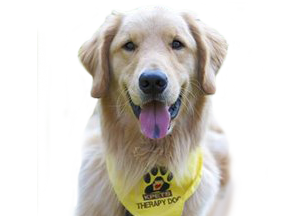 He has been a KPETS therapy dog for almost 9 years, having retired last year. He has touched innumerable people in need of comfort. His loving, caring ways impressed everyone, no matter young or elderly. I don’t know anyone who met him who did not fall in love with him. I know everyone thinks their beloved pet is tops, but Mattoon was the cream of them all. He is in my heart and I will miss him forever!